The Matias Family: Parents Meeting at the Light House! This past Sunday we had a special parents meeting here at the Light House Community Center. All of the parents, along with their children, were invited to enjoy a special program and an afternoon of fun together as a family here on the Light House Community Center grounds. Enjoy a few photos of the various events that took place! We started the afternoon singing worship songs together with all who attended! Joyce, a staff member from Holland and Andreia , from Brazil, led our time of rejoicing and singing together! Felipe gave a message to the parents about speaking words of encouragement and words of love to their children. He also spoke about the importance of parents spending quality time with their sons and daughters. This is such an important message to be speaking to the parents of the new generation living in the slum. Many of these parents present at the meeting, became parents in their early teens and many also have broken relationships with their own parents. Felipe encouraged these parents to learn from the mistakes of their own parents and chose to LOVE their children through words and actions. 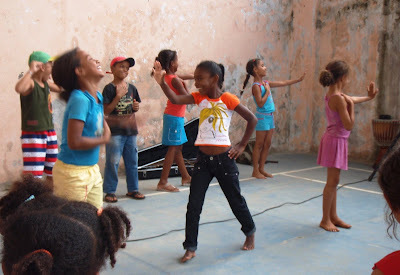 Here is our group of 7 to 9 year old girls and boys singing and dancing to a song called "Muito Obrigado!" which translated is "Thank you very much!" The song repeats over and over - "'Thank you very much Lord! I thank you! I thank you!" The kids really enjoyed learning this dance because the song is SO fun! I had to include a video of the kids practicing in this blog. All of the kids could not be here to present on Sunday, but this video below shows our whole group dancing and enjoying the song! The girl in the yellow shirt, Vitoria, is SO CUTE when she dances. She does not have the best coordination or dancing ability, but she really got into the dance and enjoyed herself. I laughed SO HARD when I was filming this clip. These children are so special and I can feel the Father's love for them! The teenage girls group presenting a dance/drama that speaks about the love and forgiveness of Father God. The girls group, ages 10 to 12, singing and doing sign language to a song. I worked with some of these same precious girls last year. The boys group, ages 10 to 12, showing off their cool dance moves to Christian Hip Hop! FREE PLAY TIME WITH THE FAMILY! During the afternoon we allowed free time for the children and the parents to enjoy an afternoon of recreation on the Light House grounds. Here some boys are playing the most loved game here in Brazil - SOCCER!!! Parents, standing by supporting and watching their children play on the court! More parents looking on to see what AWESOME swimmers their children are! Many parents from the community do not know how to swim and are extremely happy that their children can learn this basic life skill here at the Light House! Extended free time in the pool is a special treat for the kids! During our swimming time each week the kids have consistant swimming lessons and so they really value any chance to swim freely in the pool. The kids also enjoyed showing their parents their super swimming skills! Mother and Daughter Time = PRICELESS! It was so beautiful to see families playing together in the Light House park! At the end of the afternoon our team served a special typical dish from Minas Gerais, the region of Brazil where we all live. The yummy dish is called Feijao Tropero. Everyone enjoyed the food! The afternoon was a success! One of the goals of the day was to encourage all the parents and children to enjoy spending time together as a family at the Light House Community Center! We were happy to see these families valuing one another! I enjoyed your post, Laura! I hadn´t seen the video of our group, I laughed until I cried when I watched it. It's so wonderful to see the girls... growing and still pursuing the Lord. I'm sooo glad you all did this to teach and encourage the parents!!! It is soo vital and the heart of God. To turn the hearts of the fathers to their children and the hearts of children to the fathers. Also really neat to see that you have a group of teen girls and 10-12 year old girls!! I'm also really glad you are feeling better! ps. tell Joyce I love her pig-tails!